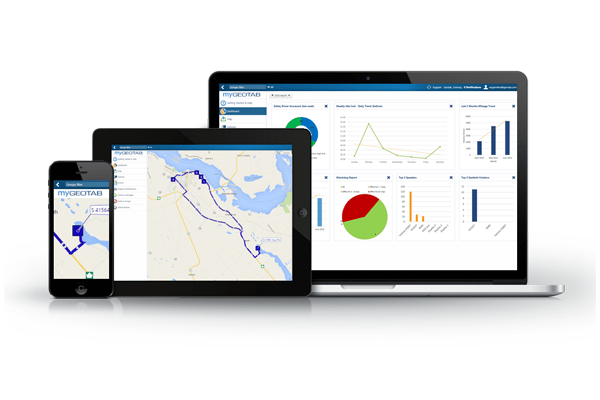 We offer a web-based GPS fleet management software solution; see all your driver and vehicle information in one place and use it to make quicker, better-informed decisions for your business. Advanced reporting flexibility makes managing your fleet easier. Start out with our standard reports, and make them more meaningful by tailoring them to your specific business needs. Easily gather, run and utilize the information you want the way you want it whenever you want it. Increase safe driving habits with in-vehicle driver feedback and coaching tools. Shared vehicles can still be individually identified with our Driver ID NFC technology. Our devices collect and respond to common status information in your vehicle. This includes engine light, engine RPM, engine hours, seatbelt, odometer, emissions, vehicle battery voltage and vehicle identification number (VIN). See where your vehicles are in real-time or choose a custom date and look back to see where your vehicles have been. Our patented algorithms provide you with accurate and detailed trip information. Reduce vehicle mileage and fuel consumption through creating zones and routes for your drivers. Also, our GPS for fleets solution lets you compare actual routes versus planned routes. Be alerted to potential critical engine health issues and easily prioritize repairs necessary for your vehicles. Detect issues early by focusing on proactive vehicle maintenance and setup vehicle maintenance reminders. The open software development kit (SDK) allows you to integrate vehicle and location information into your company’s operations or with third party add-on/add-in applications.